"There's a good chanbce they'll be utterly unavoidable in 2008" - NME. Yes, one tricky aspect of the time travel was that they had to re-born inside new parents with no memory of their future glory. Growing up they had only a niggle, a feeling to follow, and Sammy says him and Johnny spent years trying to find their way, 'We have been writing music together since we were kids, including two experimental rap albums when we were 16.' That certainly wasn't right, and it seemed they were missing something, or rather someone. Having unconsciously followed the scent of cosmic dust, local drumming legend Matt entered the scene, the future saviours were reunited. Since their true name is unpronounceable to current voice-boxes, they called themselves OK Tokyo, after the most futuristic city on the planet, and locked themselves away to reconnect. 'When Matt came along 18 months ago, everything fell into place,' says Sammy, 'We got in the cow shed and threw ideas around. Jules Verne, Blade Runner, Clubber Lang from Rocky 3 showed up, and musically, early Michael Jackson, Quincy Jones, mainly pop acts, but also bands like Outkast, who've gone into their genre and spun it up a bit. We created a dreamworld. I think you could call it escapism.' You certainly could. The results show that the cow shed jumped over the moon. Combing hypersonic disco beats, supercharged guitar riffs and stratospheric vocals melodramatic, OK Tokyo channel their ambitious energies through punk-funk towards pop choruses so huge they'll reach deep space. 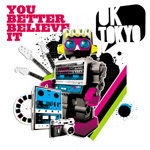 Debut single 'You Better Believe It' is the perfect trailer. Grounded in the tale of 'a relationship mishap,' it spits sparks all over the place, hitting Klaxons, Test Icicles, even Girls Alouds, and warns all coming loves about, as Sammy says, 'this is how its going to be in the future.' Simultaneously down-to-earth and on a different planet and is going to have Ming the Merciless soiling his jumpsuit. Why wait around for the future? It's already here. Debut single 'You Better Believe It' is released 31st March on Split Records.